WOW! I want one of them. Can I have it? Can I have it? I’ve never had an Airfix kit on a 1:1 scale before. Where’s the pilot? It comes with a pilot doesn’t it? Do you ever remember your first Airfix kit? I think mine was a Wellington Bomber. Not only did it come with a pilot but it came with the bombardiers that sat in the little machine gun turrets. There was one in the nose beneath the pilots’ cockpit, two in the turrets mid-fuselage (one top and one bottom) and obviously one at the back – the tail gunner. Those boys had a tough day job. Imagine that’s how you went to work every day – crawling inside a goldfish bowl shooting bullets at people shooting bullets at you. If you’ve ever been paintballing then you’ll understand that feeling of fear as the enemy bear down on you at close range. I reckon the paintball fear must be a hundred million miles from the fear these boys had to deal with in real life. But then again my Grandad handled the fear OK fighting the U-Boats. It’s all there in Blog No. 6 (Night Night). Even if you could put the fear of being shot to pieces to one side the fact your escape route from your goldfish bowl was claustrophobically tunnel-like must only have made things worse. Well my Wellington Bombardiers never had to worry about the tunnel escape route given they were glued by their arse to their seat. They weren’t going no-place. They also never had to worry about seeing the enemy shooting bullets at them given their goldfish bowl was all smeared in glue. My Wellington Bombardiers didn’t even know whose side they were fighting for because I never bothered to stick on the RAF transfers. This was mainly because I though the Luftwaffe symbol was a better design. I know I’m on dodgy territory here, but despite what the Nazis were and what they stood for they had some pretty darn good graphics guys making their symbols and their costume department were ahead of their time. The German soldier helmet looked pretty cool on those little plastic German soldiers that your little plastic British soldiers used to fight against. And they used to fight each other without prejudice didn’t they? Eventually I was given a set of American soldiers but by the time I got them I must have been eight years old or more and the war was pretty much over. I also reckon the German Stormtrooper Action Man outfit was a good seller back in the day too. All my pilots and bombardiers had names. The pilot was called ‘Smiffy’ and the belly bomber was called ‘Budge’. The belly bomber being the one stuck in the goldfish bowl on the underside of the plane. I used to feel sorry for Budge on account of the fact that one of the wing wheels was glued open and the other was glued shut. Imagine the fear he went through every time the plane landed. The top turret bloke was called ‘No-nose’ on account of the fact he had no nose because the he got over-glued and it melted his nose. Just like real life really. If you will sniff glue don’t expect to keep your nose for ever. Talking of noses, the nose bomber was called Dagga on account of the fact he used to say “dagga dagga dagga” a lot, especially when the plane was in a nose dive. The tail gunner, called TG, was a bit of a misnomer because his machine gun was glued stuck. I would imagine most of the flights in my Airfix Wellington Bomber ended like this. Ahhhh John, being from Oirlund, had never heard of Airfix before so imagine how excited he was to be assembling a full on 1:1 scale Airfix kit VW interior. This one came with no instructions but plenty of glue. Just as a proper Airfix model should be built, all the pieces were painted first before the assembly. All Ahhhh John had to do was glue the bits and pieces in place. And that’s what he did. And finally, after what had seemed ages, we had finally finished our refurb and the bus was ready to go. It’s ‘those’. Not ‘them’. When will you ever learn grammar? I’ve only ever been paintballing once. Somewhere up near Carlisle as part of Cod’s stag do. Great day and great night with Milno getting too hot in the pub, stripping off and then storing his shirt in a pint glass for safety and presumably for emergencies should he ever get cold later in the evening – which he surely did given the stag had relocated to Dumfries. I also remember waking up sharing a bed with Baldrick. There is an explanation to that by the way and it’s not what you think. There are no Nazi stickers on our bus, although it is a German product. Yeah right – like whoever painted their Airfix kit before they built it. The first thing I ever did was take the pilot off the plastic thingy thing that all the bits are stuck to see what he looked like, then see what he’d look like if I stuck glue all over his face..
 Yeah, I know. Another predictable gag. Not even that funny really. This entry was posted in The SapaBus Blog and tagged Airfix Kit, campervan refit, Type 2 interior, Type 2 Refit, VW Bay, VW Campervan. This is a GREAT blog, loved every hilarious word of it. Great writing style! We’re taking the bus out for it’s first trip in a few days time and having taken a sneak previe of the http://www.guyropegourmet.com recipes can’t wait to get the campfire cooking on the go. 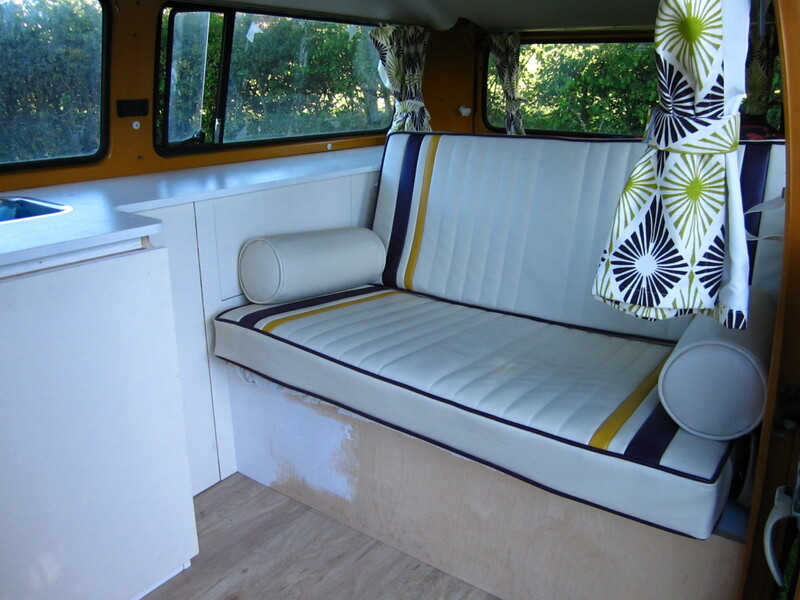 August 2009 & we bought a 1974 Bay Window VW Camper.van. This blog follows our little adventure as we slowly refurbish and renovate the the van, or bus as we call it. Not to be taken seriously. We're not sure how you got here or why, but enjoy reading and thanks for coming!